Sometimes, you need to see what is happening while you are away from your office or home. 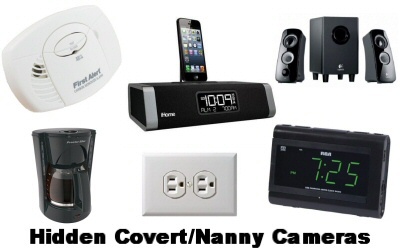 This selection of hidden nanny spy cameras is an ideal selection. We have nanny cameras available in both WiFi remote access models and SD card self-contained models to suit all of your surveillance needs. The WiFi style nanny cameras allow you to watch your home or office remotely from an iPhone, Android or PC, as well as record the video remotely on your PC. The SD card models are self-contained recording cameras, which will record directly onto an SD card in the device for later playback. Each camera is built into a fully functional device, which will blend into your environment nicely.